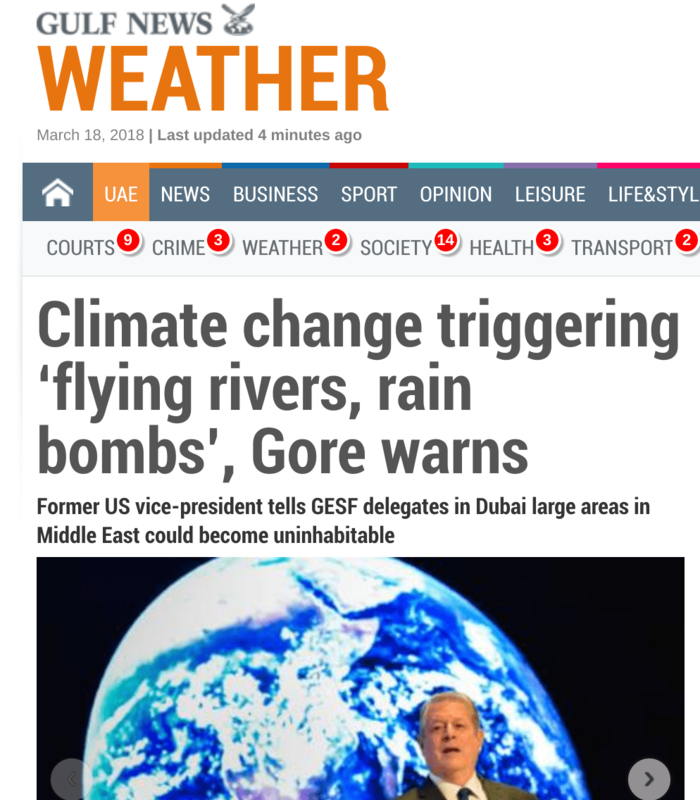 Gore issues new climate warning: Bizarre weather such as “flying rivers” and “rain bombs” are just some of the recent effects of climate change, warned former US vice-president Al Gore at the Global Education and Skills Forum (GESF) in Dubai on Sunday…global weather is becoming “extreme” and “disruptive”, mainly because of global warming, Gore explained. At this point, “climate change” is supposed to be “settled science.” And yet the actual scientific data simply doesn’t support the claim that there is catastrophic global warming—let alone the notion that human activity is causing it. Whether we are talking about global temperatures, sea levels, polar ice, polar bears, or extreme weather, global warming proponents’ claims are demonstrably false. Extreme weather expert Roger Pielke Jr., a former professor in the Environmental Studies Program at the University of Colorado and author of the 2014 book The Rightful Place of Science: Disasters and Climate Change, has repeatedly testified to Congress, mostly recently in 2017, that there is “no evidence” that hurricanes, floods, droughts, tornadoes are increasing. NOAA’s Hurricane Research Division has been tracking hurricanes that have struck the United States since 1851. The drought in major hurricane activity was a very unusual event that “likely” occurs only once every 177 years, according to a study by NASA’s Goddard Institute for Space Studies (GISS). Hurricane Harvey in August 2017, broke the twenty-five-year streak of no Category 4 to 5 hurricanes making landfall in the United States since 1992 (Hurricane Andrew) and the twelve-year record-breaking streak of no Category 3 or larger Hurricanes making landfall since 2005 (Wilma). Both landfalls and hurricane strength were “down by ~20% since 1900,” according to Pielke. The worst decade for major (Category 3, 4 and 5) hurricanes was the 1940s, according to National Oceanic and Atmospheric Administration data. In 2017, as we have seen, the nearly twelve-year record hurricane streak of no category 3 or larger storms hitting the United States came to a crashing halt with Hurricane Harvey, which made landfall near Rockport, Texas, as a Category 4 hurricane with winds of 130 mph on August 25. Harvey will go down in the record books as the top rainfall-producing hurricane, dropping 60.58 inches in Nederland, Texas, from August 24 to September 1. The previous top rain producer was Tropical Storm Amelia, which produced 48 inches in Medina, Texas, in 1978. 35As Hurricane Harvey was battering the coast, the climate activists and the media began the incessant drumbeat of how man-made “global warming” had made Harvey worse. Hurricane Irma made its Florida landfall on September 10 as a category 4 hurricane. Hurricane Maria also made landfall in the United States as category 4 hurricane. Neither storm was unprecedented. Colorado State University meteorologist Philip Klotzbach’s analysis of Irma found that it made landfall in Florida at 929 millibars (mb) of landfall pressure, tying it for the seventh most powerful storm to hit the mainland since record keeping began in the 1850s. Hurricane Harvey, ranked eighteenth at 938 mb, placing it in a three-way tie with an 1898 Georgia hurricane and Hurricane Hazel in 1954. Meteorologist Ryan Maue mocked the claims of “extreme weather getting more extreme.” That “isn’t a scientific statement but anecdotal. In a warmer world, some events may become weaker,” Maue wrote. “It’s actually been fairly quiet in the Atlantic since the 2004 and 2005 seasons. Curious how two storms change that so quickly?” Climatologist Roger Pielke Sr. wrote about the media claims linking Hurricanes Harvey and Irma to about the climate change link, “Amazing to see claims of how hurricane activity will change in future based on climate models, yet same models cannot predict past activity. Gore is most likely mind controlled. And, it’s man made- HAARP weaponry that’s doing it. More people are waking up to this fact, keep up the great work everyone! Don’t forget to read about orgone generation and Don Croft.